Yes, as a working writer, I need to earn and income. If I can’t pay the electric company, out go the lights. And the desktop. You get the picture. But I’ve also learned some tough lessons about taking work just for the money. In short, don’t do it. 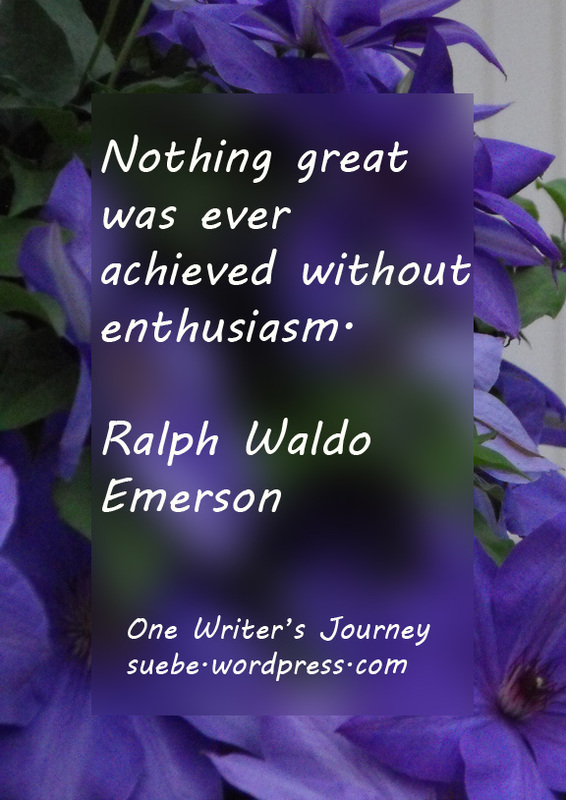 Your lack of enthusaism may not show in your writing, but it will show in your attitude. Why torment those around you in the brick and mortar world when you can use the same energy to torment your characters? No, it is simply much better to write about things you love. Fortunately, the things that fascinate me are many and they are diverse. I was that kid in school who loved math and english and geography and social studies and biology . . . This enthusiasm for a wide variety of topics is reflected in my nonfiction writing. In May, I submitted the young adult book on the Ancient Maya. I’ve got degrees in anthropology and history so this was a topic custom-made for me. They could have given me just about any culture and I would have been happy but I got to pick one that fascinates me. Woo-hoo. I’ve got a work in progress that I just need to polish up. It is a picture book on animal coloration. As a biology nut, I love learning about animals and how they function in their environments. Environments. I can be just as fascinated studying about the desert as I am reading up on grasslands or forest. My current work-in-progress is a mildly (to me) disgusting book on the biology of vomit. What is it? Why is it necessary? And how does it function in a wide variety of species? Fortunately, I can bring equal levels of enthusiasum to all of these topics as well as a variety of fiction picture books and novels. What is it that you love? Are you writing about it in some way? If not, what’s stopping you? If you write hi-lo, check out the new Red Rhino imprint with Saddleback Educational Publishing. Written at the first grade reading level, these books are designed to engage readers in grades 4 to 6. Characters are old enough for the readers to identify with and topics range from science fiction and the paranormal to sports, historical fiction and realistic fiction. 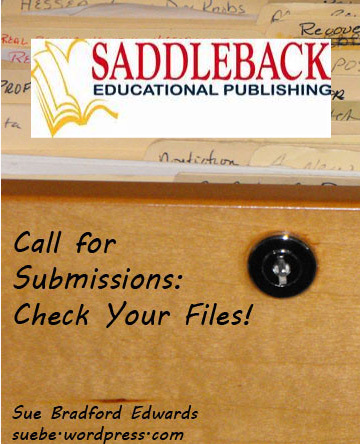 Saddleback’s submission guidelines don’t specific what they want for this particular line, but do include a mailing address. Sadly, this is one of the many publishers that responds only if interested but do check them out if you have something that might fit this new line. While reading the Open Culture blog, I discovered the perfect Japanese word. Tsundoku. This noun describes the pile of unread books that you create as you continue to buy more and more but don’t catch up. I think all writers experience tsundoku. I know that my bed side table is a hazard of printed articles and magazines with the book piles lingering here in my office. But I’m left wondering. Is there are corresponding word for electronic reading left downloaded and unread? Bookshout, with its daily free offering, is a particular hazard to me as are the free Kindle books made available very now and again. I’ve paid for all of one e-book but have 29 Bookshout books and have read 2. My Netgalley stats are better; I’ve been approved for 10 books and have so far read 5. My Kindle for PC contains a frightening 98 books, a total I don’t entirely believe but am too lazy to disprove. I’ve read about 20 of them but in my defense, many of these are reference books which I never intended to read in their entirety. 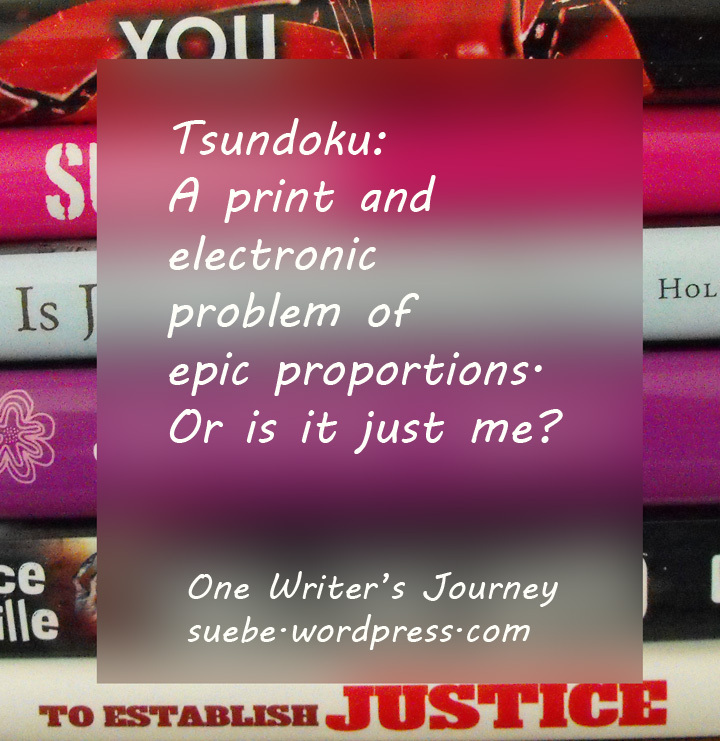 Still, it’s obvious that I have quite an electronic tsundoku building up. Does anyone else have this problem? Obviously, I need to get on that treadmill and read. I hate having to post that a publisher is no longer taking submissions, but at least this one is only temporary. Tor.com, which I blogged about back in June, is closed to submissions from now through the end of September. They are doing this so that they can catch up on submissions, which is a good thing if you’ve already sent them your speculative fiction short story. If not, you have just under two months to polish something and get it ready to go. Read their full guidelines and check to make sure they’ve reopened the transom here. 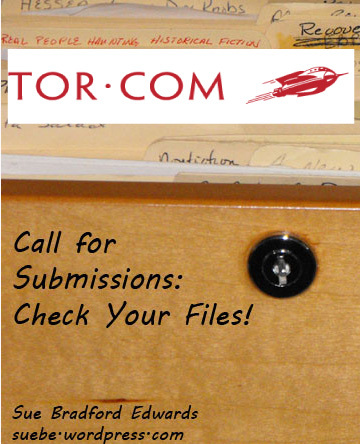 This temporary halt doesn’t impact submissions for the new imprint, Tor.com Imprint which continues to accept unagented submissions through the end of August. Although this is primarilly an adult market, they are accepting young adult submissions. Novellas should be 17,500 words or longer. Be sure that your world building is top notch before you submit and that your characterization and plotting include emotion. No previously published material. For more on what they want and how to submit, read their guidelines here. As always, good luck in sending in your work! I posted a call for manuscripts from Spellbound back in May but this is a new call. Note that this speculative ficiton magazine reads only for one theme at a time. This means that if you want to submit for a theme other than the “current” reading period, you need to wait. Raechel Henderson, fiction editor, wants protagonists who actively resolve story problems and conflicts. Word length up to 2500 words. Marcie Tentchoff, poetry editor, wants short poetry, whether free verse or traditional, with elements of speculative fiction. Length 8-36 lines. Payment: 2.5 cents/word for stories, $10-$20 for poems. 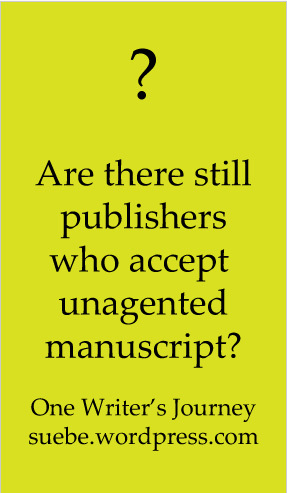 Do you think that you need to find an agent because no worthwhile book publishers take unsolicited manuscripts? Think again. These are just some of the publishers who take submissions from authors. Arbordale: This publisher used to be Sylvan Dell. Check out their amazing science themed books. Boyds Mills Press: An educational publisher of poetry, picture books, middle grade fiction and nonfiction. Charlesbridge: Accepts unsolicited but wants an exclusive submission for a period of time. Several of my friends have picture books with Charlesbridge. Chronicle Books: Not only does Chronicle take unsolicited, they take e-submissions. Creston Books: Rotten Pumpkin is my favorite Creston Book. Be sure to check this publisher out. Eerdmans: This is admittedly one of my dream publishers — I simply adore so many of their picture books. Arthur A. Levine: Scholastic may be a tough nut to crack, cut this imprint takes unsolicited work. Read their guidelines and check out their catalogue. Philomel Books: Not all Penguin imprints accept submissions but the SCBWI Market Guide details how to submit to this particular imprint. Albert Whitman: This is another favorite. Note: They are taking e-mail, not snail mail, submissions. Workman Publishing: This publisher has several imprints and publishes both children’s and adult titles. This isn’t an exhaustive list but these ten publishers are enough to keep most authors busy — be sure to research each publisher before you submit your work. This isn’t to say that at some point in your career you won’t want an agent, but if you don’t have one you can still market your own work. Here is another fairly new imprint looking for work. Shiloh Kidz is an imprint of Barbour Publishing. I didn’t see specific guidelines on the site for Shiloh Kidz but Barbour is accepting manuscripts. The first list will debut in November 2014. The news that I read on Writing Career.com was that the imprint will feature books for readers ages 3 – 12 in a variety of formats and media. This Christian imprint plans to publish religious novels, scripture-based stories, Bible reference, and fiction stories. Kelly McIntosh is the Vice President of Editorial. Check out the site and the tone of their books if you think that you have something suitable. And, for a bit of levity, an absolutely hilarious grammar lesson, Wierd Al style. I simply refuse to admit which rules I have difficulty remembering. Redleaf Lane is a new imprint committed to producing high quality children’s picture books. Check this one out carefully before submitting because what they want is very specialized in terms of setting. All of the books they publish take place in “group care” settings. They never use the term but I’m assuming here that they mean day care or various after care programs. The stories not only take place in this particular setting, the situations revolve around situations that are likely to come up in this setting. Redleaf Lane is a part of the larger publisher, Redleaf Press. If you have a manuscript that fits what they are publishing, you can find their address on their site. Submission information is “coming soon.” Good luck sending in your work! 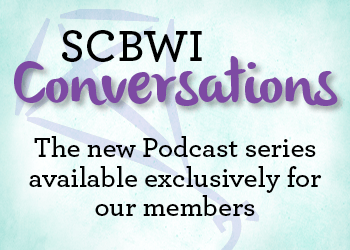 Very few of us can afford to attend all the great conferences out there, but the SCBWI (Society of Children’s Book Writers and Illustrators) has another great benefit free to members — a series of educational pod casts. So far there are four SCBWI Conversations posted. SCBWI talks with Chronicle Books editor Melissa Manlove about picture books, mythology, poetry and the power of the spoken word. 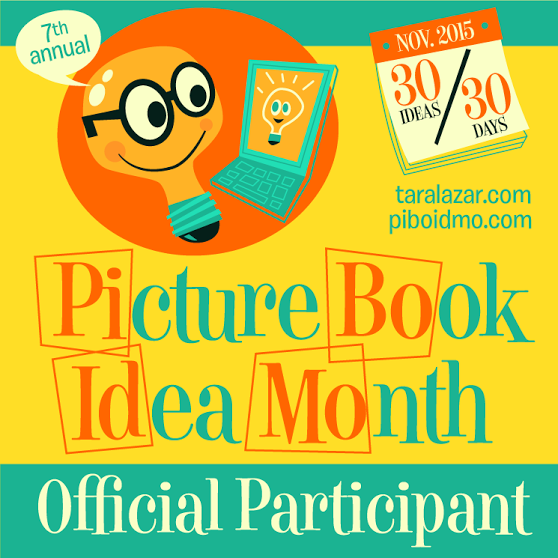 Curious about the life and work of a picture book editor? That’s in here too! I heard Matt speak at our own Missouri conference so I’m eager to hear this Conversation with the author the young adult novels Ball Don’t Lie, Mexican White Boy, We Were Here, I Will Save You, and The Living. In this conversation, Lin Oliver talks with the vice president and publisher of Arthur A. Levine Books, an Imprint of Scholastic Inc. This one is sure to be exciting because Levine has connected with several of his authors through SCBWI. Join this New York Times best-selling children’s book author as she discusses her writing path and diversity in chlidren’s literature. She is the author of Speak and Chains, both National Book Award finalists. All you have to do is sign into the site and then click on this link to hear one of these great sessions. You can also down load them to save and listen at your leisure. 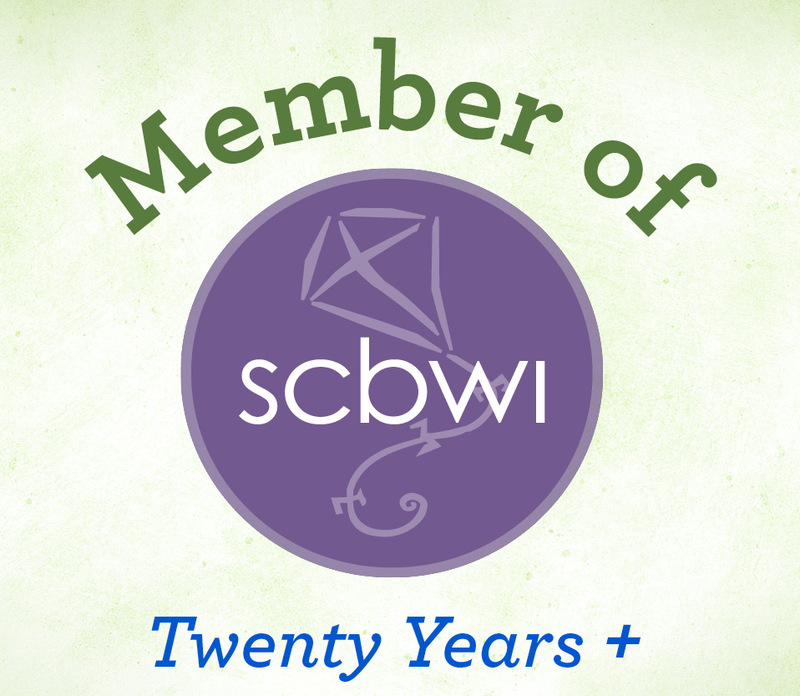 Thanks to SCBWI you can listen and learn today.